Click here for current weather conditions and a 5-day forecast. 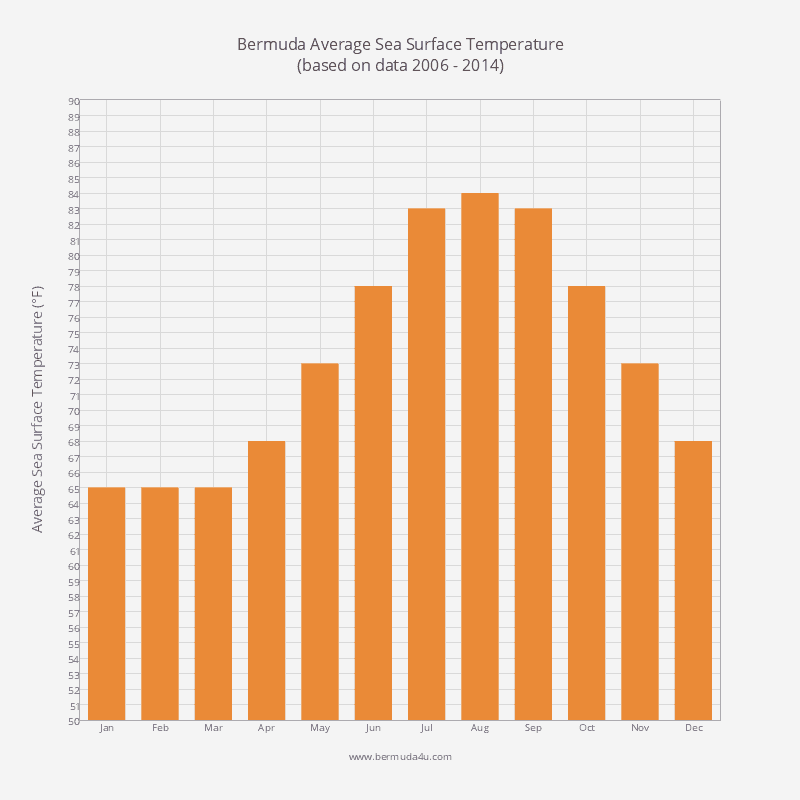 Throughout the year the average water temperature in Bermuda is usually a couple of degrees higher than the average air temperature. In the summer months, May to October, the average surface water temperature is 80 F. Bermuda Day, towards the end of May, is the day that most Bermudians take their first dip in the sea. The sea is at its warmest in August, with an average temperature of 85 F.
In November and December the water temperature averages 70 F. The period from January to April is the coldest, with an average temperature of 66 F.
Most divers prefer to visit Bermuda in the summer months. One advantage of diving in the winter is that visibility is better, ranging from 125 to 175 feet. In the summer visibility drops to 75 to 125 feet. The table below shows average sea surface temperatures from January 2006 to present. I am visiting Bermuda March 26th to April 2nd. Is it warm enough to be in bathing suits on the beach? I was thinking this was Caribbean. The air temperature at the end of March should reach about 70 F at midday. I’d personally feel warm enough in a bathing suit on the beach. The water temperature will be in the upper 60s. Bermudians consider this too cold to go in the sea. I don’t. It’s a personal thing. When do you think the water will get cold this year? The ocean starts to cool down late October to mid-November. Look at the table above. You can see water temperature is reasonably consistent over the years. It is more predictable than other weather variables. Going to Bermuda next week? How is the weather looking? We have climate changes. Thanks. Guide to scuba diving on the island. Includes detailed information about the reefs and the marine life, water visibility, shipwrecks, and dive centres.